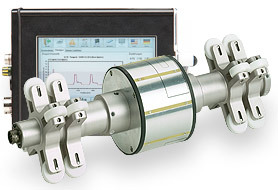 Applying the IDS 8100.C the diameter of case bores of extruders can be detected precisely. The wear of the machine which has been generated due to abrasive raw material, temperature and pressure can be controlled without contact. The IDS 8100.C works with integrated capacitive displacement sensors. The actual bore diameters are detected over the whole process part length. As the axial sensor positions are detected as well using a cable-length measurement system, local deviations in diameter can be reliably and quickly found. In doing so, each sensor position is related to a diameter in the longitudinal axis of the bore hole.